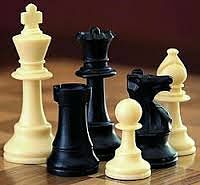 Anyone interested in playing chess, from beginner to Grandmaster, is welcome to join the chess group. Boards and chessmen are provided and there are chess books and magazines available. If interested, speak to Brian or Toni Spruce, or enter your name on the sheet at the Tuesday Forum. Come along, keep your neurons active and play chess!